Hi Dr. Lauren!!! Quick question, what kind of toothpaste do you recommend for my little one? Hi everyone!!! This is a great question, but with so much information out there, it can be tricky! Perhaps the embedded questions within this simple question are: 1) should I be using a fluoridated toothpaste for my child; 2) should I be using a children’s toothpaste or; 3) can I use an adult toothpaste on my child? The oversimplified answer to this question is, yes, your child should have their teeth brushed with fluoridated toothpaste twice daily. Many studies over the last century have shown the effectiveness of fluoride in caries prevention. However, I won’t go into depth on the mechanisms of how fluoride helps prevent cavities. Instead, I will answer this question based on my experience and my beliefs. As stated in one of my previous blogs, the American Academy of Pediatric Dentistry (and I) recommend that children under three years of age should have their teeth brushed twice daily by a parent with a rice-size or smear of fluoridated toothpaste and children over three years of age should have their teeth brushed by a parent or with parental supervision with a pea-size amount of fluoridated toothpaste. These recommendations on dosages of toothpaste are used to help reduce the amount of fluoridated toothpaste to which children are exposed. To further help reduce the amount of fluoride that could potentially be ingested by a child, my office recommends wiping your child’s teeth and mouth with a washcloth or gauze after brushing. However, rinsing should be avoided to prevent complete washout of the fluoride from the toothpaste. Also, as discussed in one of my previous blogs, sometimes in very young children, toothpaste gets slimy and creates excess foam which can prevent the removal of all the plaque from the teeth. 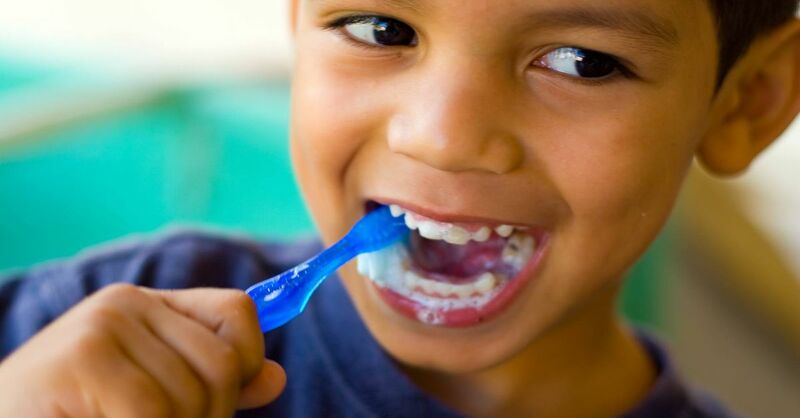 In these cases, the child’s teeth can be brushed first with a dry or slightly wet toothbrush without toothpaste, followed by brushing with a smear of fluoridated toothpaste and then wiping with a gauze or washcloth. There are a mind boggling variety of brands and toothpastes on the market and most do a fantastic job at marketing to you! Sometimes the hardest job as a parent is to select the most appropriate toothpaste. Most infant toothpastes (Orajel, Tom’s of Main, Nuk, etc.) do not contain fluoride. These toothpastes do not offer much to children other than introducing them to flavors. Most children’s and adult toothpaste have the same amount of fluoride which is approximately 1,100ppm. The primary difference between children’s toothpaste and adult toothpaste is the flavoring. Toothpastes that are marketed for children typically offer a variety of flavors—strawberry, bubble gum, melon, etc., while adult toothpaste offerings are often limited to some variation of mint. Something most folks don’t discuss is that, in the end, a decision to use a children’s toothpaste or an adult toothpaste comes down to flavor when all other factors are the same. Does your child prefer a minty flavor or bubble gum? That is the decision maker. On a personal note, I prefer “pastes” instead of “gels” for my toothpastes. This is simply based on texture and aftertaste that I do not like with gel toothpastes. As a side note if a child or adult has sensitive oral tissues and has a tendency to develop mouth ulcers, canker sores, two ingredients that should be avoided in toothpastes are sodium lauryl sulfate and cinnamon. These ingredients can irritate the tissues and sometimes cause or prevent the healing of ulcers. If more clarification is needed, please reach out with your questions. Thanks!